Sponsor’s dream: One of the top downhill and dual-slalom riders in the world, Great Britain’s Bernard Kerr is a serious threat in any event he enters. After being crowned the King of Crankworx at Whistler in 2015, he won the Red Bull Hardline event in the U.K. this past September. Bernard uses his Pivot Phoenix for downhill racing, as seen in this shot from last summer’s Canadian Open at Whistler. While it sometimes seems that the top professional downhill racers come from backgrounds in BMX or motocross racing, Bernard Kerr may be the exception. He rode bikes, of course, but he also spent a good part of his youth riding horses and playing ice hockey, even winning a National Championship title with his hockey team. Bernard took up mountain biking at age 13 and soon rose to be one of the top riders in Great Britain, then the world. He now competes in both downhill and dual slalom, and he’s a phenomenal rider in both disciplines. The highlights of his career have been his King of Crankworx title in 2015, where he was the top overall rider competing in multiple disciplines, and his more recent win of the Red Bull Hard Line event in 2016, which was one of the wildest downhill races in history, an event put on by his fellow Brits, the Athertons. Bernard showed us his Pivot Mach 6 for our feature this month. It’s pretty much his all-purpose bike when he doesn’t need the long travel of his full downhill bike, the Pivot Phoenix. Bernard has two Pivot Mach 6 bikes—one that he uses for trail riding and the other one that he uses to race dual slalom, an event where acceleration and cornering speed are as important as the bike’s ability to handle jumps. Read on to learn more about Bernard and how he sets up his bikes. MBA: Where did you grow up? Kerr: Surrey, England, just outside of London. MBA: What kind of work do (did) your parents do? Kerr: My mum owns a party/fancy dress shop. MBA: When did you first learn to ride a bike? Kerr: When I was young. Kerr: I guess my parents. MBA: Did you compete in other kinds of sports before mountain bikes? Kerr: I played ice hockey and rode horses before, which I have some trophies in. MBA: When did you get your first mountain bike? Kerr: When I was 11. MBA: When did you start competing on mountain bikes? MBA: How did you finish in your first competition? Kerr: I came in third but won the following day. MBA: Did you win any titles as an amateur? Kerr: Yes, I was the Junior 4x national champion twice, Junior DH champion and European DH champion. MBA: What have been your best results as a pro? 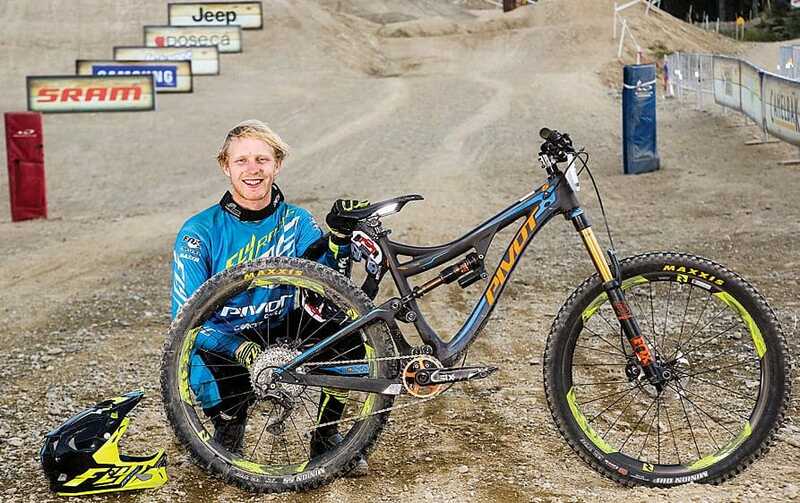 Kerr: Ninth Hafjell World Cup, King of Crankworx 2015, seventh Leogang World Cup, fifth Val di Sole World Championships and the Red Bull Hardline 2016 winner. MBA: What awards did you win in school, if any? MBA: What other sports have you done? Kerr: Ice hockey, horseback riding, tennis and now some motocross. MBA: Can you tell us something interesting or unusual about yourself or your family? Kerr: I was part of the ice hockey national championship-winning team when I was younger. MBA: Is there some other interesting fact or trivia that people might like to know about you? Kerr: All of my brothers’ and sisters’ names begin with the letter B. Fast guy: Kerr takes a fast corner at Whistler on his Pivot Mach 6 in the 2016 Dual-Slalom finals with Tomas Slavik. 4. Inner tubes (or tubeless system). “Race Face SIXC carbon, 760 millimeters wide, 35-millimeter rise, with 8-degree backsweep and 5 upward. It’s the same for all my trailbikes, but 768 millimeters on my DH bike, so just a little narrower. 16. Chain—and how often you change it? 23. Cables and housings: Shimano, stock. 24. Headset: Pivot, sealed bearings. 25. Water bottle cage: None.